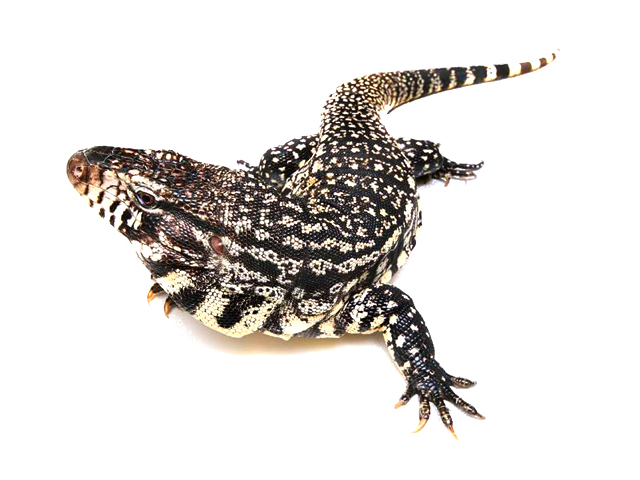 Argentine black and white tegus are sometime simply called black and white tegus, although this can lead to confusion as there is also a Colombian black and white tegu (the Colombian is similar but smaller and less docile). Sometimes they are also called giant tegus, or big headed tegus. As hatchlings they have an emerald green complexion from tip of their snout to midway down their neck with black markings; the emerald green eventually fades to black within a couple of months after shedding. Argentine tegus make good pets, as they have a tendency to become attached to their owners and are generally quite docile as adults. Personally, I am a firm believer that bigger is better when it comes to enclosures. A good rule of thumb is the MINIMUM size should be calculated as: adult length of the reptile = width of the cage and double that for length. I keep hatchling/juvenile tegus in 1.8 x 0.6 x 0.6 meters (6x2x2 feet) and my adult tegus in 2.4 x 1.2 x 1.2 meters (8x4x4 feet) homes. I strongly suggest staying away from all glass tanks as they are very poor at keeping proper humidity levels and temperature. Tegus suffer ill effects of improper housing very quickly but they will not show any signs of this for extended periods of time; helping to foster the idea that free roaming is suitable for tegus. Unfortunately, this delays tegus visiting the vet for such issues until they are 6-10 years old which is far too late to correct the problem. There are many options available such as cypress mulch, aspen shavings, repti bark, and eco earth/coco husk, to name just a few, but I recommend a topsoil/sand combination. This promotes proper humidity and natural behaviors that tegus would normally partake in, and if you decide to take the next step (talked about below) you are already on the right path. Being a terrestrial lizard, they love digging and creating burrow; therefore, you need something that will not fall apart as they dig. Another option that is becoming more and more popular is introducing a bioactive element to the soil. This can be achieved by placing living organisms that replicate a natural environment. These organisms help maintain cleanliness and help break down any defecates that you may miss. Once properly achieved, bioactive substrates can go months and even years without having to be cleaned or replaced. Tegus are diurnal (active during the day) and benefit from full spectrum light to replicate the sun’s natural light. Natural sunlight contains UV rays, which are required for a healthy animal to help aid its internal processing systems. If housing your tegu outside is not an option you can find UVB bulbs at most pet stores that have reptile supplies. Tegus can grow quite large and need to heat their whole body when they bask. To do this, I recommend having multiple lights with lower wattage to provide a large basking area. This will also assist in keeping your electricity bill lower by not using such high wattage, and will help to prevent against major burn risk. For heat/temperature you want to have a basking spot of 48-55 °C +/- 2 (120-135 °F +/- 5), the warm side around 32 °C (90 °F) and a cool side of about 21 °C (70 °F). Tegus need a high temp basking spot to maintain energy/thermoregulate and to effectively digest their meals. Obtaining these temps consistently can be difficult if your enclosure is too small or it is too open. Proper tegu behavior for a good setup is basking for shorter periods of time followed by activity. If they are basking all day long your heat is probably too low. Fresh water should be provided daily for drinking. Providing moving water helps maintain humidity and (in my experience) encourages your tegu to drink on a regular basis. Also, providing a water dish or a separate “bath” area large enough for your tegu to immerse themselves in allows your tegu to help regulate their comfort level. Tegus do best with 70-95% humidity. Choosing a proper substrate will help maintain a good level of humidity as well. Humidity is needed to help aid the tegu in shedding and keeping it hydrated. It is almost impossible to maintain this level of humidity in a free roam situation. Daily misting is fine and can be set up on an automatic system but avoid soaking. Tegus have a very large feeding response and will usually attempt to eat anything that resembles food. I have always fed mine on a whole prey diet and always recommend that over anything else. Variety is key when it comes to any animals’ diet. For a great food list for your tegus, I strongly recommend taking a look at this page. It is so comprehensive; I will let it speak for itself. Like any animal you need to build trust with them or you will have an animal trying to defend itself every time you come near. Let them come to you and spend as much time with them as they will allow. They are naturally curious so with proper respect and patience they will come to learn and know how to respond to you, and vice versa. There are a few different strategies for taming that I have learned and tried over the years and may help in the process. Remember that there is more than just one main thing that has to be right for tegus; everything has to be complete with their husbandry. In some cases, some things just don’t work for certain animals; therefore, you may need to accommodate accordingly.Wear an old shirt (one that you’re ok to not get back) for a couple days at work or for a couple of rigorous workouts to sweat it up and then leave it with them in their hide. This helps them associate your natural smell with safety. Keep an occasional eye on the shirt as after a while it will just be dirty, ripped to shreds and can be removed and replaced if needed. One of my favorites is using the bathroom technique. Safely carry them into the bathroom and let them explore (pre-clean the bathroom and tegu-proof it). They will start to cool down eventually and will seek out warmth. Being the only warm blooded body in the room, the tegu will come to you and enjoy sitting with you to utilize your heat. I do this for no more than an hour or so to allow them to return to their enclosure and resume proper heat and comfort. Cleaning schedules can vary depending on the type of setup you have your tegu in. Some keepers who have opted for a bioactive style enclosure have been able to go years without having to do major cleanups. Others prefer to do a monthly clean up to help maintain a clean environment; I always do spot cleaning to keep the tanks clean. Tegus can suffer from most forms of common lizard ailments/problems like impaction, gout, dehydration, mites, scale rot and respiratory infections (RI). The biggest ones to lookout for is calcium deficiency, otherwise known as a form of MBD (metabolic bone disease), vitamin D overdose, tail loss (regenerated tails), inadequate heat and humidity. Remember that every care sheet is a basic guide. It can’t solve all problems that each individual household may face. I can’t express how much that constant learning is a must for any animal. Everyday there are new things being learned and shared with others. Seek as much information as you can, even if you may not agree with it at first because at least you know something else that may benefit YOUR animal one day. To have a pet of any kind is a choice, so always make the best choice for them and enjoy every minute of the love they return.